Sometimes leftovers get under your skin. I made lentils on Tuesday and used some of them in dinner. Then I forgot about them. On Friday I thought about putting them in a salad. But I had other salads, and didn’t feel like draining the lentils from the liquid. On Sunday they niggled at me. Finally, I had a revelation. Soup is perfect for lentils and their cooking liquid. I didn’t actually need the soup, as I had plenty of other leftovers. But I did not want to abandon those lentils. Opening my refrigerator, I got excited as I found more and more things to add to this soup. Onions (not kept in the fridge), which I’m not usually in a hurry to use up because they keep. But this batch of onions had a lot of soft spots. Then there was the celery that I needed to examined carefully to salvage the sweet and green parts. It was worth the effort. 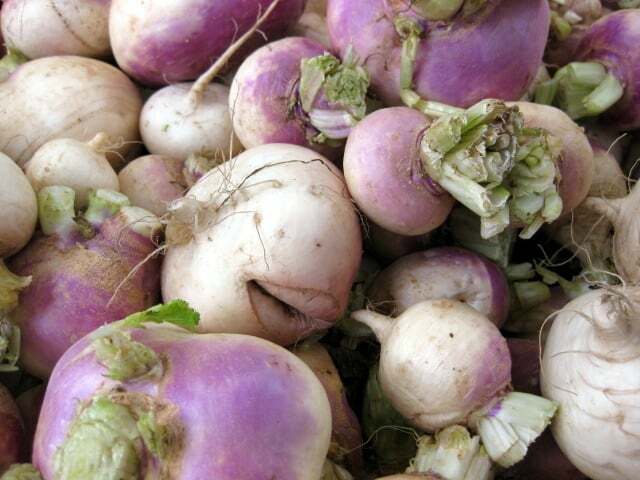 Turnips–my husband and I had each bought some, among the first of the season (although they didn’t look like it). I used only half of a large one so the turnips wouldn’t overpower the soup. A couple of carrots, including one I had peeled on Friday and not used. A few small zucchini, waiting for their moment. And finally, the crown—a handful of basil, still in great condition. Now it was time to make sure that the lentils were okay. Since they had been in a closed container since Tuesday, I was optimistic—justifiably as it turned out. I’m glad I chose the soup over the salad, as that salad wouldn’t have lasted long. Soup extends the life of leftovers. I sent a good portion of soup over to my neighbor with flu, and we managed to use up the rest of my leftover food when my older son came home unexpectedly for dinner. Lesson: You’ll never go wrong when you have an extra pot of soup in the house. Chop two onions and saute in oil for 5-10 minutes. Cut celery, carrots, turnip and zucchini into two-inch chunks. Add to your food processor and chop finely. Really, you can cut them in any shape you like, allowing longer cooking time for larger pieces. Add chopped vegetables to pot. Chop basil and add to pot (see below). Add salt or tamari/soy sauce to taste. In the pressure cooker, steam for 5 minutes. In a conventional pot, heat to boil and simmer for 15 minutes. Add basil for the last 5 minutes. This post is part of the Zero Food Wast Challenge at Penniless Parenting. Oo, this looks delicious! I never think of putting basil with lentils, but that combination sounds really great! Thanks for linking up to my Zero Food Waste Challenge. Way to go with using up those leftovers! Thanks, Penny. What doesn’t go with lentils?